You've been working on your portfolio for months (or at least it seems that way) and you're almost at the finish line except you need that perfect presentation book to house all of your blood, sweat, and tears. A professionally made portfolio book is a direct reflection of your work and will set the tone for the rest of the interview and allow you to stand out from the rest. It can feel overwhelming to finalize the last piece of the puzzle so we've outlined some helpful tips we've passed on to our customers creating their own perfect custom portfolio book. 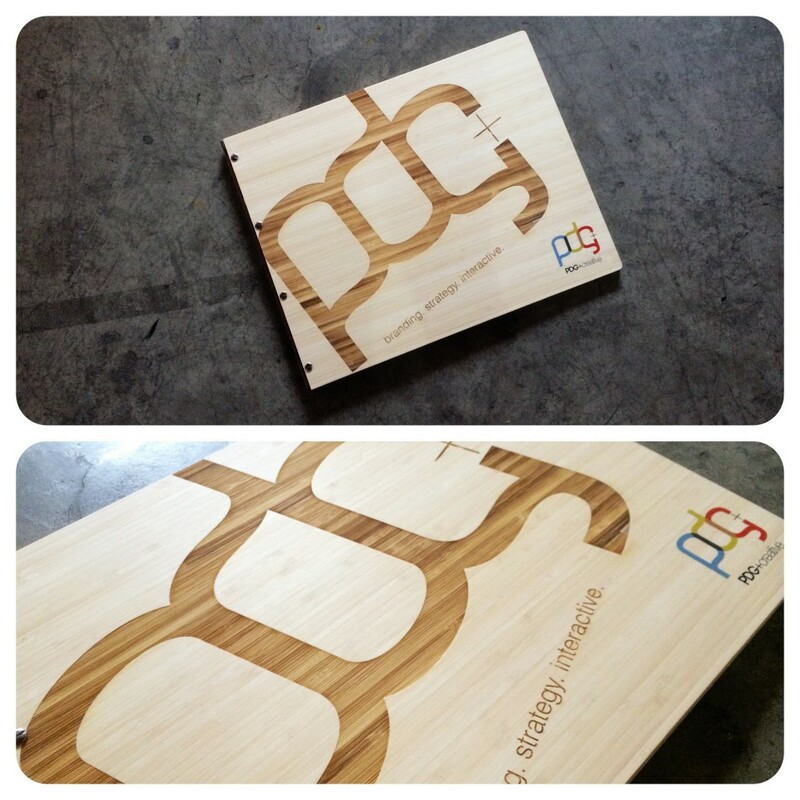 Here are some things to consider before deciding on the best presentation vessel for you. Are you a LEED accredited Interior Designer or Architect and want communicate this right off the bat? 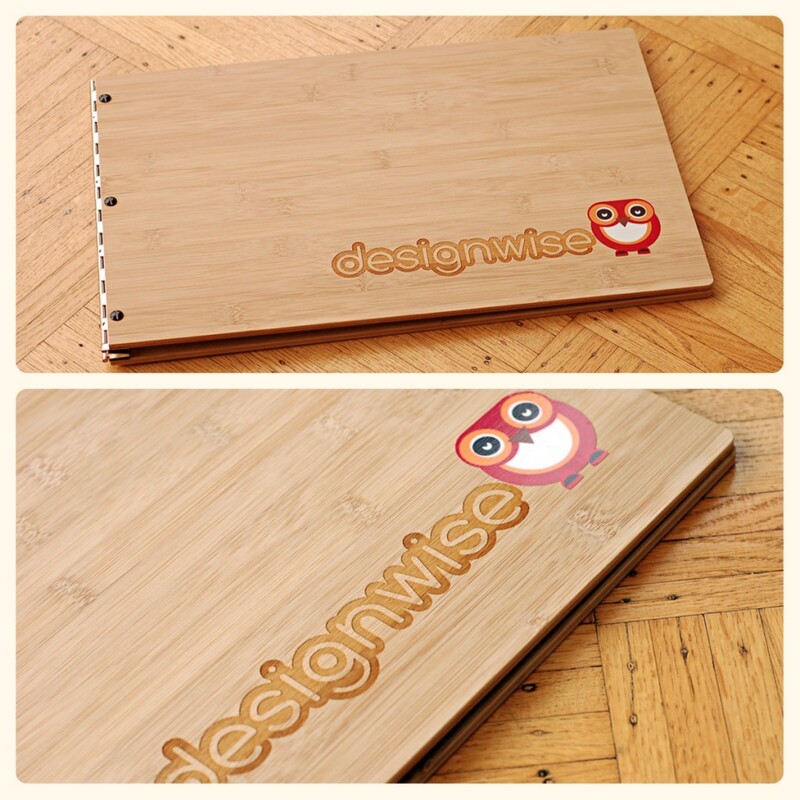 Customizing your portfolio book with one of our bamboo materials and an engraving will be perfectly in line with your message and ideology since it's LEED certified. Maybe you're a young and eclectic fashion designer with a sophisticated yet fierce ready to wear collection. 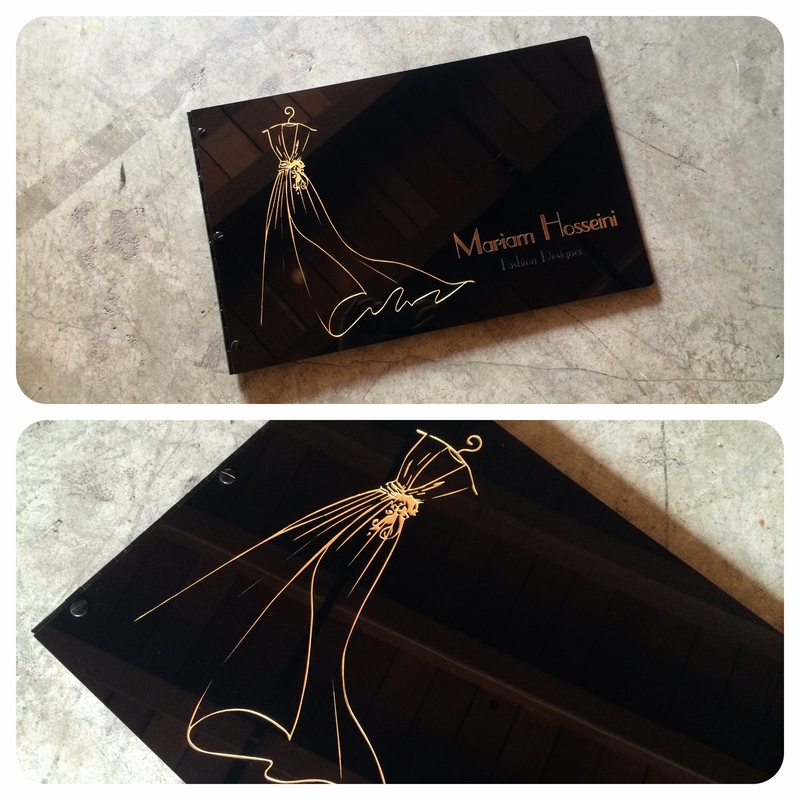 Choosing a matte black acrylic with an engraving and cut-out treatment will perfectly compliment your work. Over the years we've created a comprehensive library that contains hundreds of examples of our work and collaborations with designers and we hope it will serve as an inspiration to you when deciding on how to customize your own portfolio book. 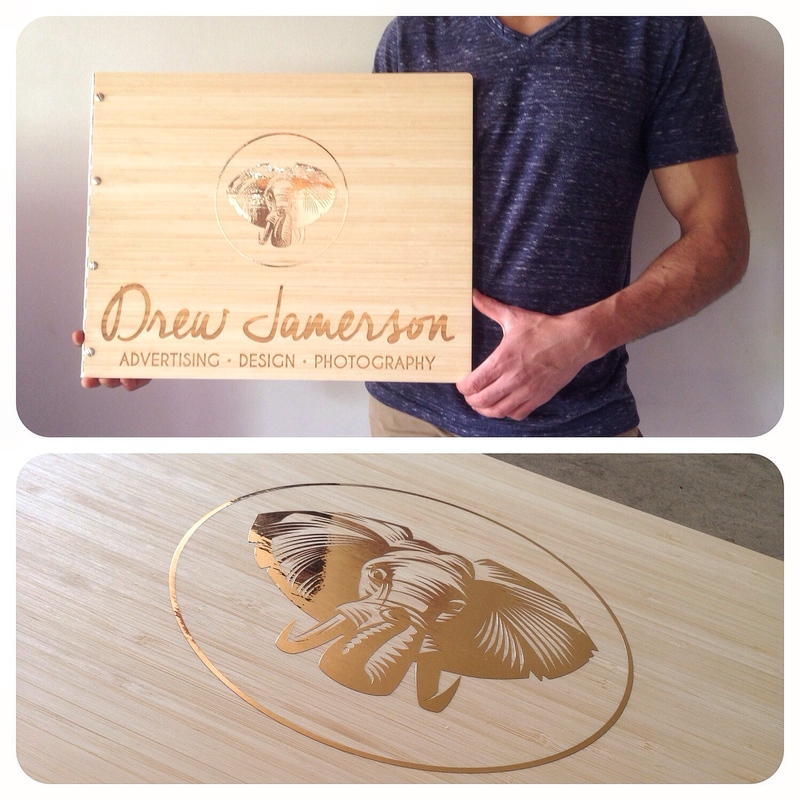 Custom graphic design portfolio book with engraving and vinyl decal treatment on caramel bamboo. Deciding how mobile and agile you want to be when seeing clients and potential employers are things to think about when deciding on the size of your portfolio book. Do you plan on shipping your portfolio book or traveling often to see potential clients or will your trips be local and comfortable? Other things to consider are how detailed your prints are and if having a larger book will facilitate showcasing more intricate work. 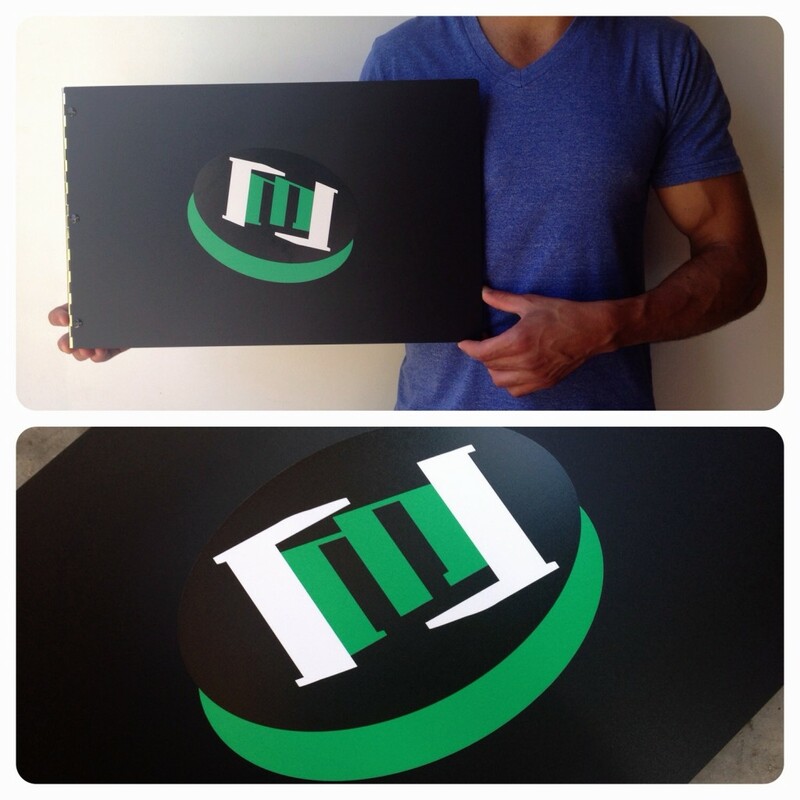 An 11 x 14 portfolio or 11 x 17 is large enough to showcase your beautiful prints but not so big that it feels awkward on a potential employer's or customer's desk. It will be lighter and more comfortable to carry then a larger size which could become cumbersome if you need to ship it or travel a lot. 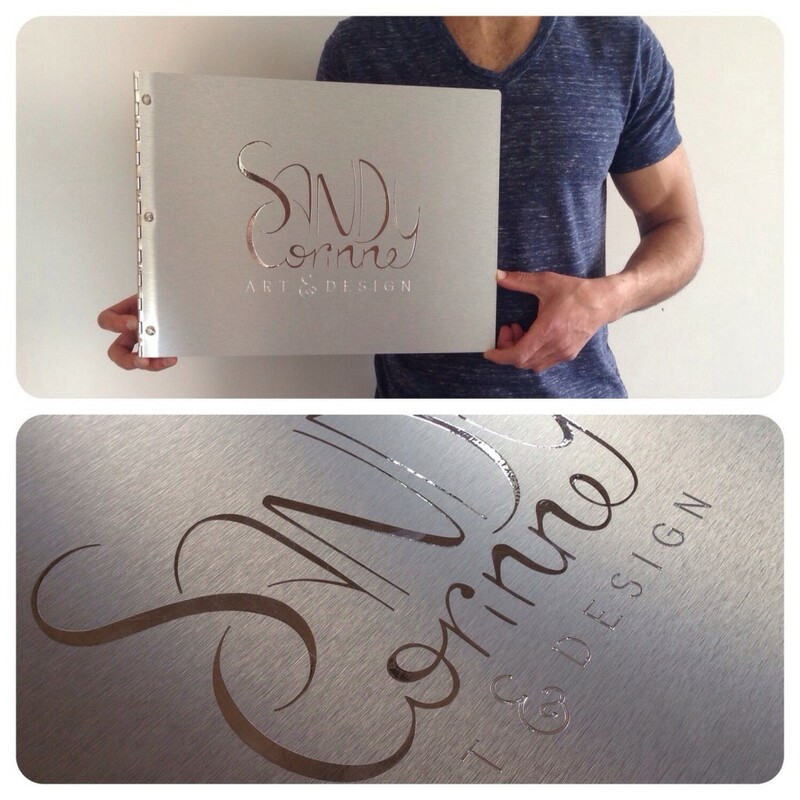 So you've browsed through our library of custom portfolio books, decided on the size and material and now it's time for the fun part, choosing a treatment or treatments to apply to your branding and logo. We've outlined some details about the different treatments that can be applied to your custom portfolio. 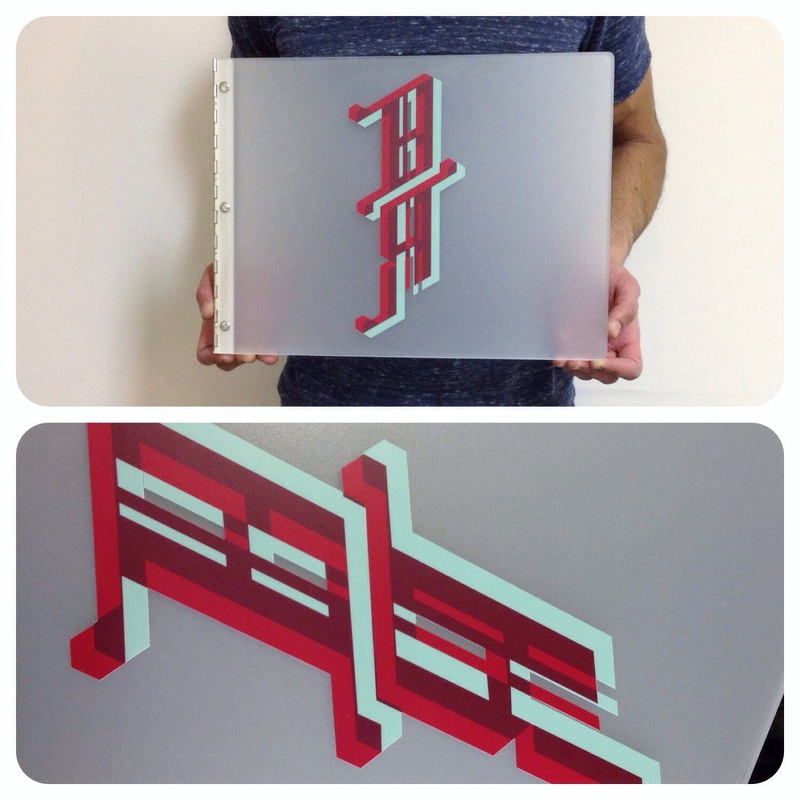 Our engraving treatment permanently etches acrylic, brushed aluminum, or bamboo materials for a classic and timeless look. 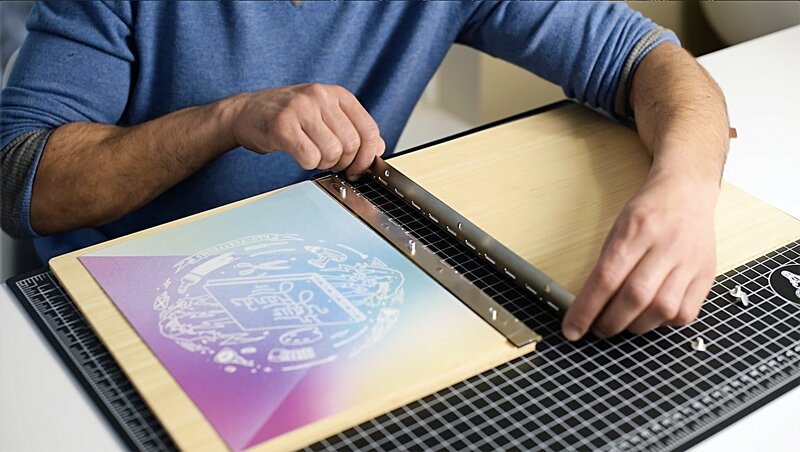 This option can be further customized with engraved color fills which is a process completed by hand where a specific color is added to the engraved area and is bound to make an impression. 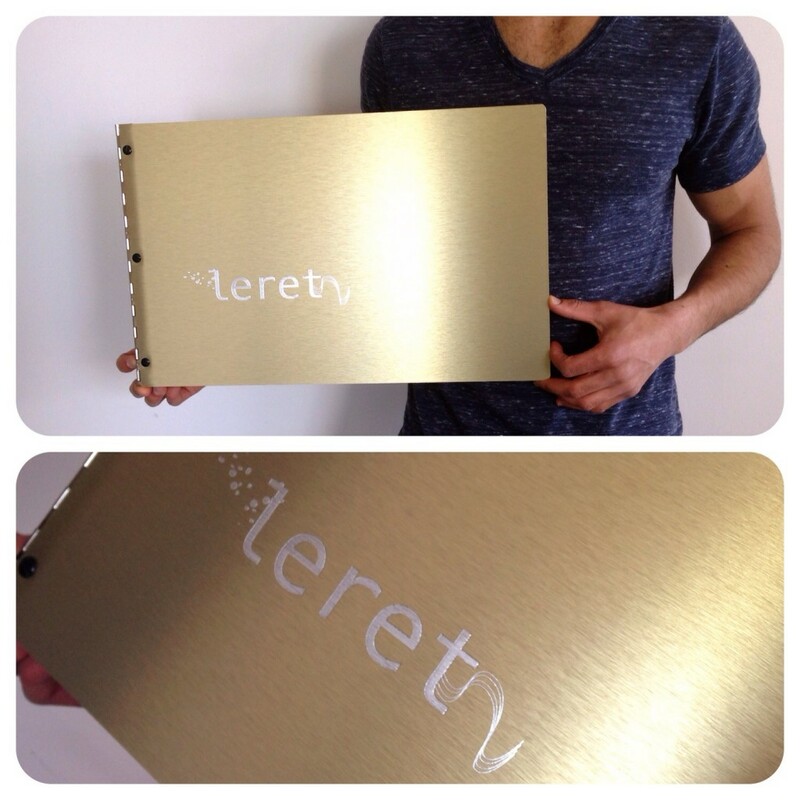 Custom fashion design portfolio book with engraved color fill in gold. 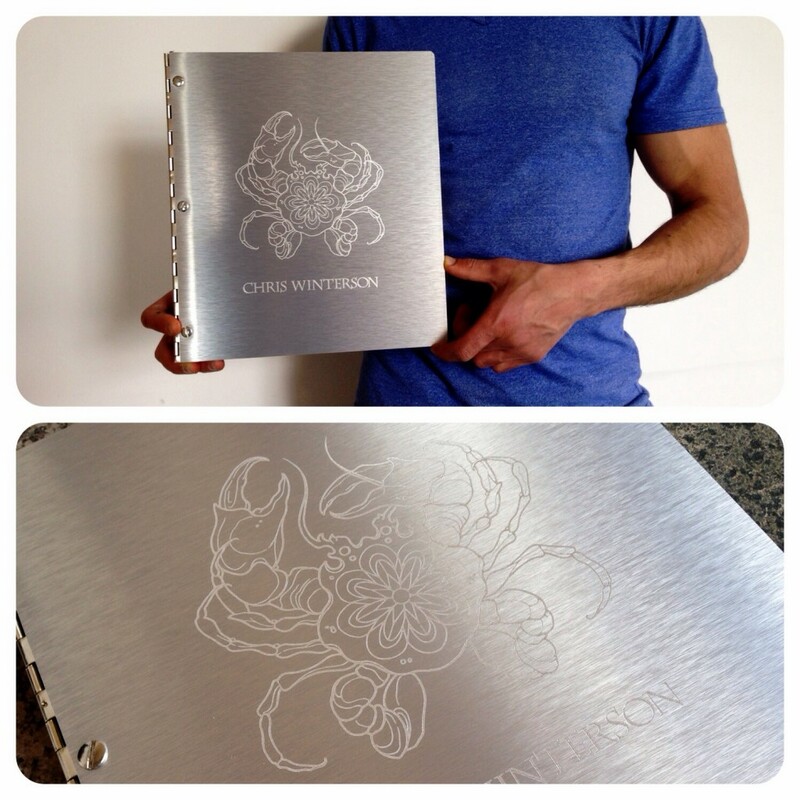 Custom fashion photography portfolio book in white acrylic with engraved color fill in gold. If you have a colorful first page or want to incorporate a pattern in to your cover, you can combine an engraving with our cut-out design and have the first page pop through the cover for a more dramatic effect. The cut-out treatment lends a dramatic and edgy feel and will add an element of surprise to your portfolio book. 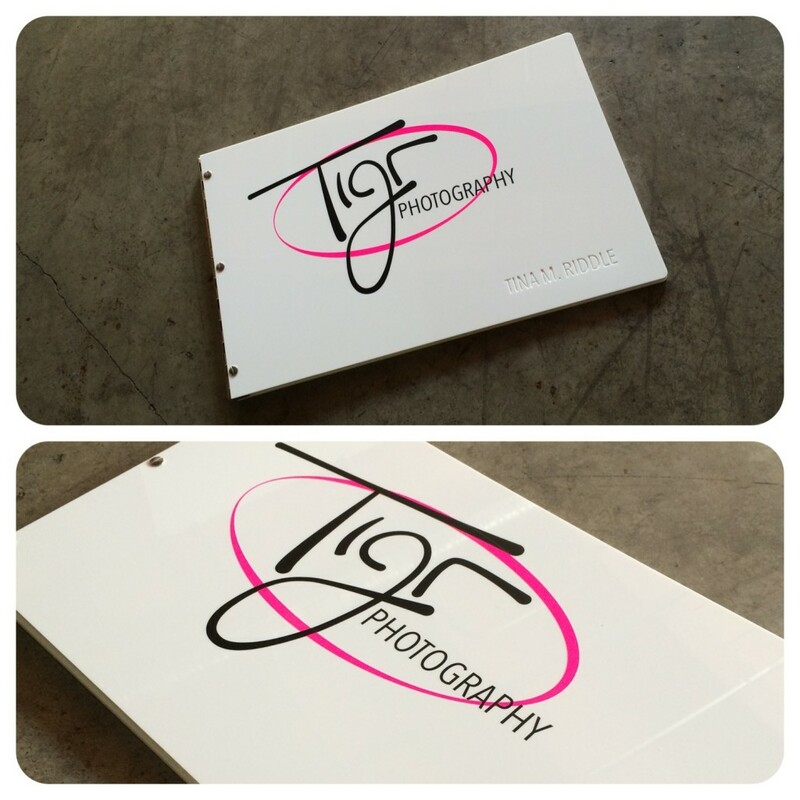 Vinyl decals are best suited if your branding includes color and you prefer a seamless treatment on your portfolio book or in combination with a cut-out or engraving. Metallic foils provide an easy way to add instant shine and come in silver, gold, blue, green, and red. 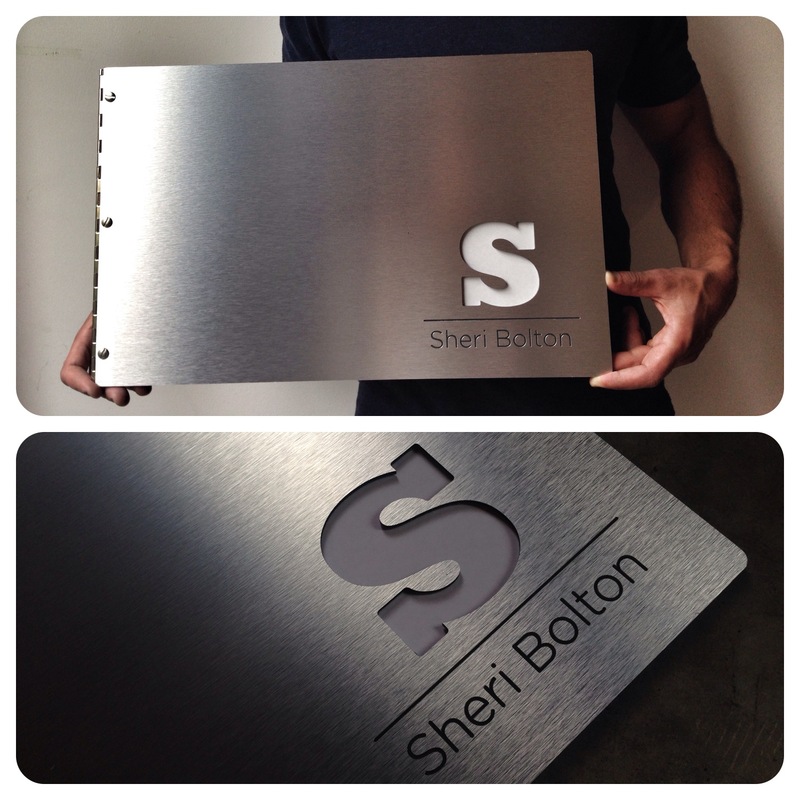 You can choose to incorporate a metallic foil to a single design element or to your entire logo. 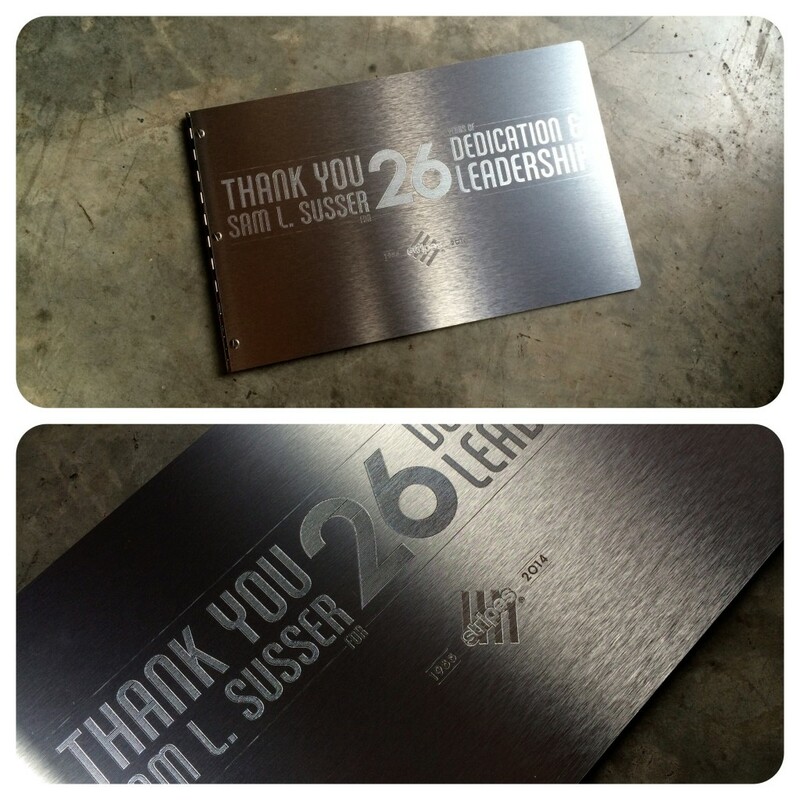 The burnishing treatment is exclusively for our brushed aluminum materials and lightly etches the surface to reveal a beautiful silver engraving. 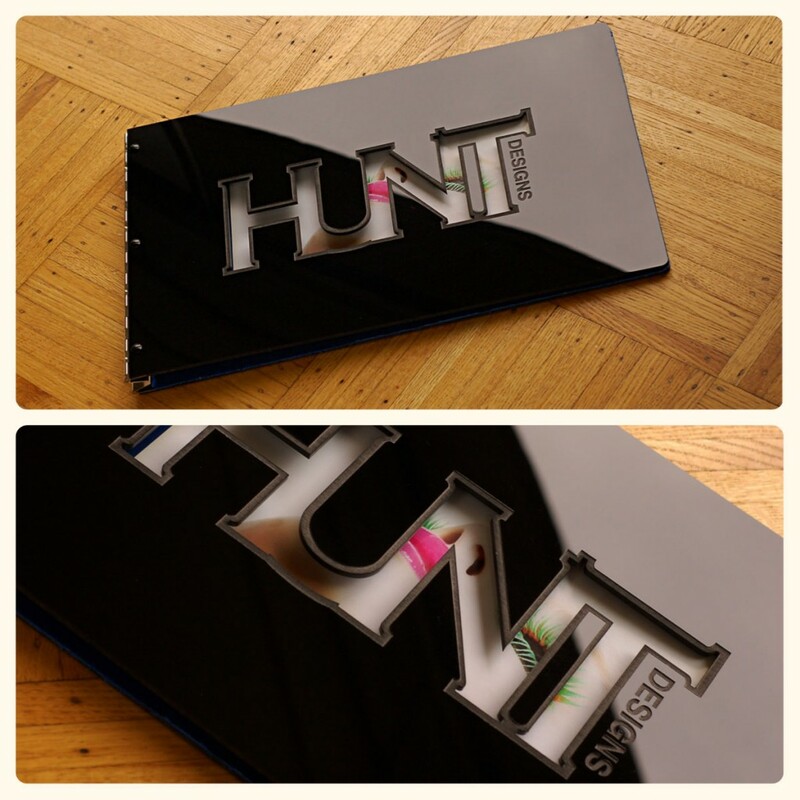 This treatment works best for more intricate designs on the brushed aluminum material. One thing to keep in mind is that the brushed gold and bronze material will result in a silver etching rather than a gold or bronze color. The combinations and permutations of treatments for your portfolio book are endless so have fun with it! If you are unsure or need a second opinion, shoot us an email or give us a quick call and we'll guide you through the process. Rest assure that no matter what combination of treatments you choose, you are in great hands and we'll make it look professional and dreamy. 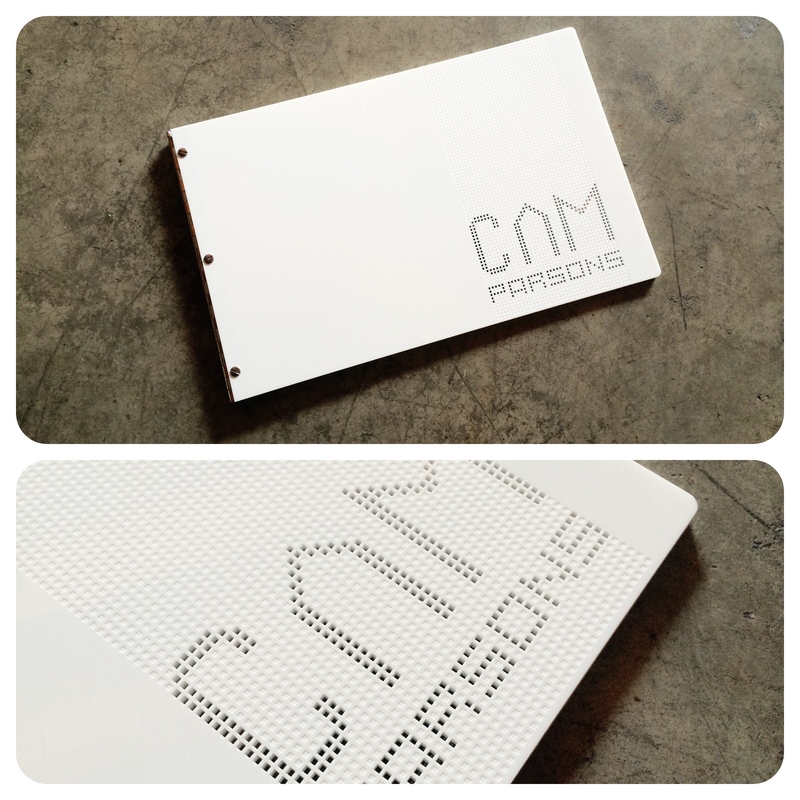 How will you be inserting pages in to your custom portfolio? Do you prefer having plastic over your pages or do you want to create a more tactile experience for the viewer? 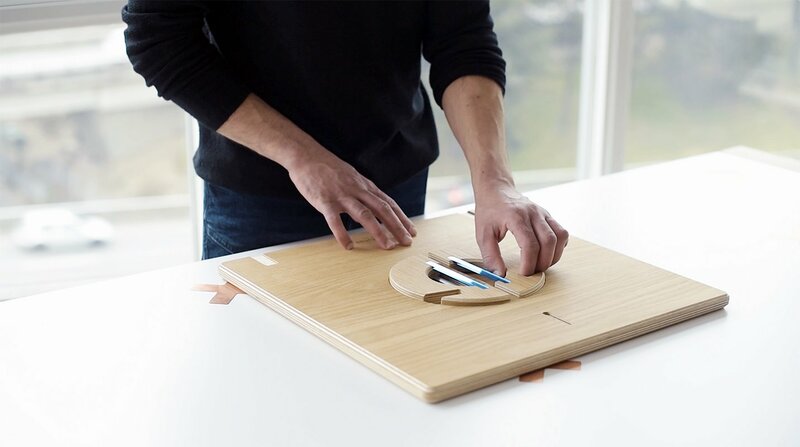 This will determine whether you use hinge strips, printed pages, or sheet protectors. 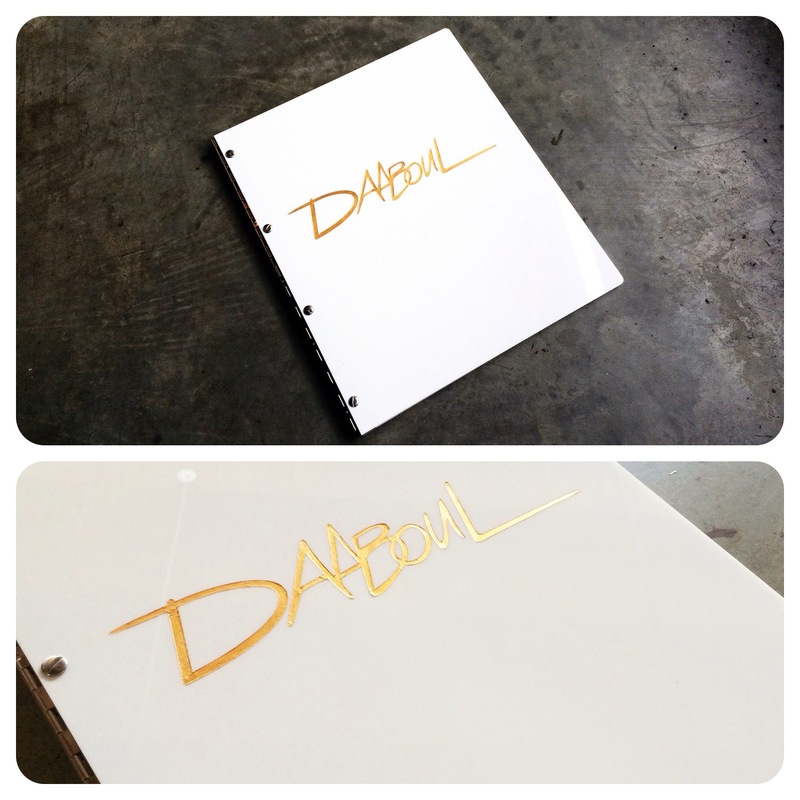 Learn more about the 3 most popular options of properly inserting your pages in to your portfolio book. 20 well executed pieces of your work trumps 50 so-so pages so share only your best even it it means you won't have as much as you'd like to show. Your first page will set the tone so you'll want to make sure it's a strong piece. 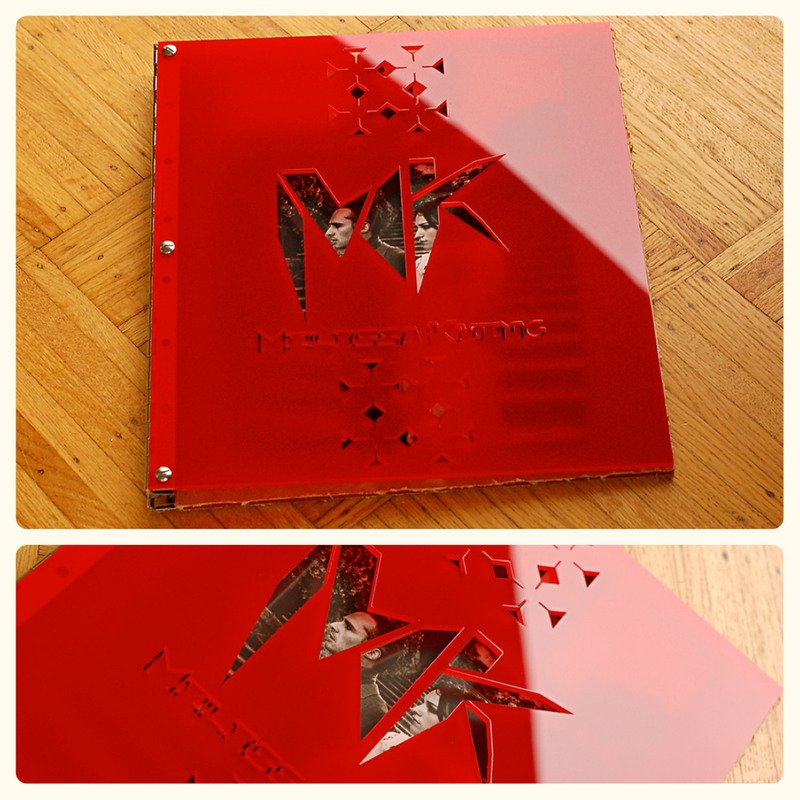 It's always best to spread your best work through out your portfolio book rather than front-loading it. You'll want to finish on a high note as well so include a piece you're really proud of in the end. 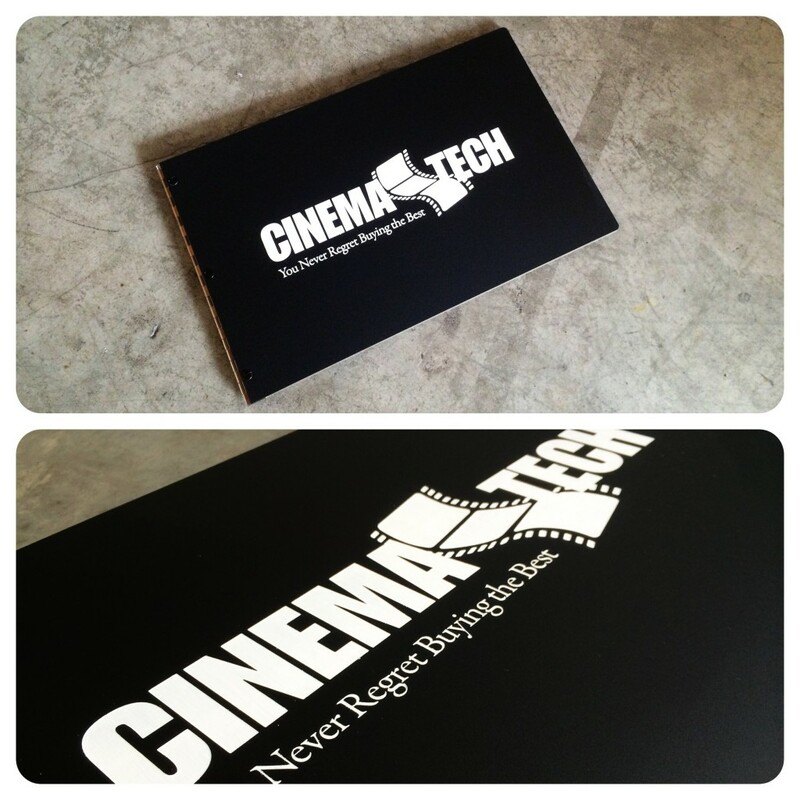 The magical thing about a screwpost portfolio book is that you can easily add and remove pages so make use of this wonderful feature and cater your work towards the potential client or employer you're going to see. For example, If you're applying for a job at a digital agency, do some research and see what industry they serve and align your work as closely as you can to the type of work you'll potentially get hired for. This level of customization shows that you mean business and you've done your research. If you're a design student, pick your instructor's brain and fine tune your portfolio as best you can. Ask for constructive criticism from others outside of the design world, maybe Bob your Uncle? They may offer up a new perspective or reveal something about the fluidity of your work by the way they browse through it. Ask trusted friends and colleagues what they think can be done better and take their feedback in to consideration. You've made it through the door and you're one step closer to landing an awesome client or dream design job so take a moment and give yourself a self-high five. You've got an awesome custom portfolio, a well thought-out body of work, and you're ready to rock! Still have questions? Feel free to get in touch with us and we'll guide you through the process.